The first six months of play: essential toys for newborns. You picked out your stroller and registered for a diaper pail. What about the fun stuff? Newborns need safe, stimulating toys to help them explore the world around them. Here is our baby toy registry checklist, intended for your baby’s first 6 months. Babies use toys to explore their 5 senses. Many baby toys are designed to stimulate several senses. Newborns have poor eyesight, so they love bold black and white patters. Older babies enjoy bright contrasting colors and mirrors. Look for interesting textures and embroidered details, which babies will explore with their little fingers. 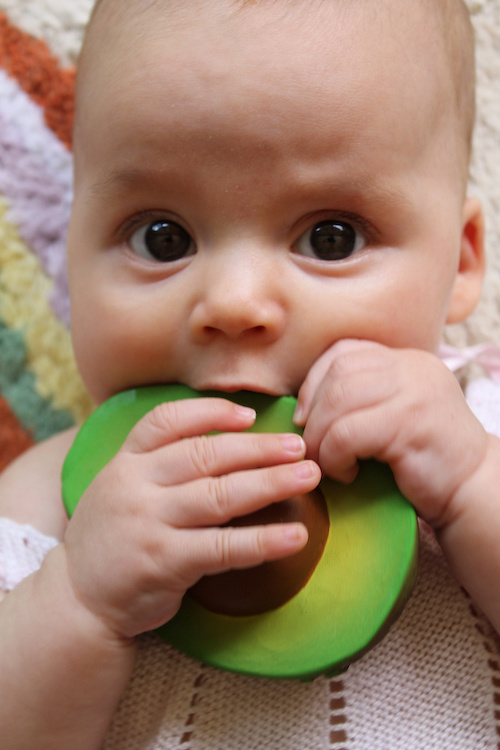 Babies love things that rattle, crinkle, chime, and squeak. Of course, no sound is sweeter than your voice, so you should read aloud to your baby from day one. Some toys are mildly scented. We love the light vanilla scent in Baby SweeTooth teethers. Select a few toys to fasten to the stroller or car seat for play time on the go. These will encourage batting, reaching, and grasping. You will want several teething toys that will stand up to hours of chewing. We recommend toys made of sealed natural rubber, food grade silicone, or untreated wood. Food grade silicone is dishwasher safe and freezer safe. Natural rubber and wood are great eco-friendly options, but you need to wash them by hand. Who doesn’t enjoy something soft and snuggly? Loveys are a hybrid stuffed animal and blanket meant for babies. Look for embroidered eyes, which are safer than beads. Remember that babies should not sleep with any soft toys until 1 year of age! Until then, you should supervise lovey time. It’s never too early to read to your baby! Your baby will love the sound of your voice and the sight of the pictures. Soft books let your baby “read” on her own, flipping the pages to explore the pictures and sensory details. No small parts. That means a baby could not break or chew off a small part. No holes for mold to grow inside. No strangulation hazards, including amber jewelry. Nothing for the crib. Let you baby enjoy toys while you’re together and awake, but let her sleep safely without them.